The problem of patina, which McCracken has recently proposed as a general term to deal with that property of goods in which their age becomes a key index of their high status, disguises a deeper dilemma, the dilemma of distinguishing wear from tear. That is, while is many cases, wear is a sign of the right sort of duration in the social life of things, sheer disrepair or decrepitude is not…. Objects with patina are perpetual reminders of the passage of time as a double-edged sword, which credentials the “right” people, just as it threatens the way they lived. Whenever aristocratic lifestyles are threatened, patina acquires a double meaning, indexing both the special status of its owner and the owner’s special relationship to a way of life that is no longer available. The latter is what makes patina a truly scarce resource, for it always indicates the fact that a way of living is now gone forever. Yet, this very fact is a guarantee against the newly arrived, for they can acquire objects with patina, but never the subtly embodied anguish of those who can legitimately bemoan the loss of a way of life. Naturally, good imposters may seek to mimic this nostalgic posture as well. but here both performances and reviews are a more tightly regulated affair. It is harder to pretend to have lost something than it is to actually do so, or to claim to have found it. Here material wear cannot disguise social rupture. — Arjun Appadurai, 1993, “Consumption, Duration, and History,” in Streams of Cultural Capital, D. Palumbo-Liu and H. U. Gumbrecht (eds. ), Stanford: Stanford University Press. Referentiality –or knowing what cluster of ideas we refer to when we say “old money,” for instance– is an unstable thing. Does aestheticization deracinate a plantation history, or merely insist that such a history does not matter? For what might an “owner’s hat” be nostalgic, if nostalgia is the modern phenomenon of borrowing a “lost” sentiment or sensibility from the past for present usage? What does it mean to apprehend or be attached to something understood as lost, when the spatial or temproal dimensions of that loss cannot help but include chattel slavery or colonial racial rule? The dead do not stay down while their clothes come forward. Not to dive even deeper into the rabbit hole, but I suppose what I find problematic about the trad blogs is how whimsical they are about longing for the days of yore. It’s very easy for middle aged white guys to romanticize the 50s and 60s (http://www.acontinuouslean.com/2010/02/15/las-vegas/), because then they would have been even freer than they are now. For me to think of the ’50s is to consider times of terror, heartbreak and violence. While these garments’ manufacture is new, some of the questions I asked earlier of vintage politics seem relevant here. What are the vocabularies of vintage clothes and how do these vocabularies produce value for the vintage-clad self? What feelings do vintage clothes and their histories inspire, in whom? What do these feelings do — to our understanding of the past, other bodies? As I consider these and further possible queries, it would appear that vintage can be about the evaluation and preservation of an item or an ideal –a beautiful dress, a beautiful woman– against the ruin of time, or vintage can be marshaled to mark ruin as important, as a significant event in the social life of that thing or ideal. As Jefferson points out, the evaluation and preservation of a beautiful item from another time and place might easily slide into the evaluation and preservation of an associated (terrible, no-good) ideal. Nostalgia for a particular era or its sensibility can become dangerous, especially when such a sensibility might include qualifiers such as “dignity” or “freedom,” “classiness” or “old-school glamour,” which are also shifting measures of human value. (Consider some of the nostalgic remarks about “respectability” here.) But the adaptation of these dress styles can also fashion defiance, marking the ruin of these eras in these styles’ unruly revisions by those once denied their wearing. Perhaps we must distinguish between the meanings that self-fashioning persons assign their clothes, and the meanings that lend a bloody social life to things like an “owner’s hat.” They may overlap; they may not. I think that there’s no coming down on one side or the other here: it’s a “both”/”and more” situation. I think vintage clothing is just that – vintage clothing. I don’t feel that wearing it idealizes a certain time period, I think we wear what we think is flattering on ourselves. I most definitely consider myself a feminist but sometimes it is possible to overthink stuff. To paraphrase Freud, sometimes a cigar is just a cigar. Clothing matters because it is through clothing that persons are understood to matter, or not. Consider the Sartorialist’s captions for the presumably homeless man, or his driver, which attribute to these anonymous figures qualities of human dignity and pride because of what they are wearing. Consider the hijab, and all the histories and conflicts that hinge upon the presence of absence of the veil as a sign of civilization and modernity or its opposite. Consider legislation throughout the centuries to regulate what might be worn by whom: European medieval sumptuary laws forbidding the conspicuous consumption of the bourgeoisie; Dutch colonial missionaries insisting that African “converts” abandon their “heathen” clothes in order to reform their bodies and souls; World War II-era rationing bans on the material extravagance of the “zoot suit,” the informal uniform of black and Chicano youth, as “unpatriotic;” and contemporary legislation across cities in the United States criminalizing black male youth in sagging jeans. The strange, changing category of vintage is no exception. Vintage is a commercial designation (what signals the distinctions between vintage, thrift, secondhand, and plain ol’ used as qualifiers?) and an aesthetic and industrial evaluation (which fashions pass muster as aesthetically salvageable? 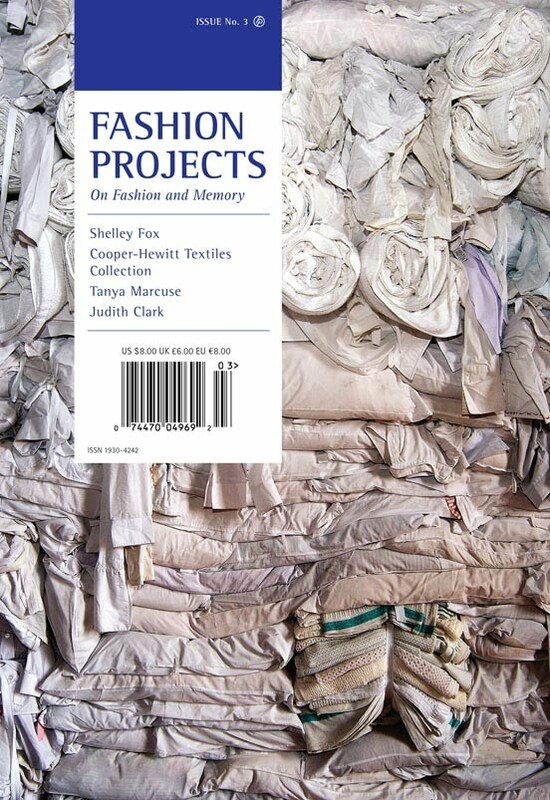 how much do a garment’s conditions of manufacture contribute to its aesthetic or commercial value?). For instance, what new hierarchies between used clothes does vintage create? 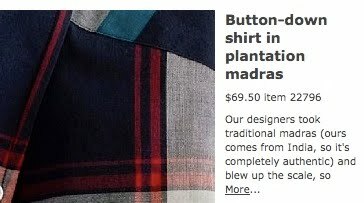 What marks an item of clothing as “vintage” or as simply “outdated”? Is it the body that activates its meaning as either positive or negative? On whose bodies does vintage appear “authentic,” or “period-appropriate,” or alternately unfamiliar and unknown? How did the market for vintage emerge? What are the differing retail and commercial forms (from expos to eBay) for vintage markets? What clothes, whose clothes, are dealers and buyers looking for? As Footpath Zeitgeist notes in her new investigation of vintage sizing and clothing fit, “What did fat chicks used to wear?” What are the vocabularies of vintage clothes (e.g., “individual style,” “uniqueness,” “quirky,” “original,” “one of a kind”) and how do these vocabularies produce value for the vintage-clad self? What feelings do vintage clothes and their histories inspire, in whom? What do these feelings do — to our understanding of the past, other bodies? As I consider these and further possible queries, it would appear that vintage can be about the evaluation and preservation of an item or an ideal –a beautiful dress, a beautiful woman– against the ruin of time, or vintage can be marshaled to mark ruin as important, as a significant event in the social life of that thing or ideal. I feel those responses missed the point of our posts…. The main reason I enjoy vintage clothing is because it is pretty and different from what I can find in mainstream stores. It’s not like race and identity politics are foremost on my mind when I go vintage shopping. But being able to take pleasure in the lush folds of a 1950s dress or a shimmery 1960s evening sheath doesn’t mean I can’t also devote brain space to thinking about the more difficult issues vintage collecting brings up. The two aren’t mutually exclusive. In my case, I’m taking advantage of the opportunity to be mindful about the injustices dealt to Asian Americans and other minorities in the US during the last century, as well the more difficult aspects of Taiwan’s social and political history. 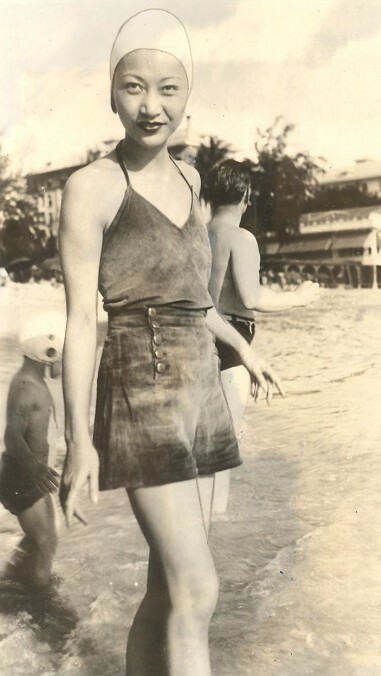 I am absolutely not saying vintage enthusiasts who don’t think about those issues are shallow; my passion for vintage fashion and design just happens to intersect with my interest in social history. I’m grateful for that because it makes the past come alive in a very immediate way. And Julie from the fabulous (new!) feminist fashion blog a ‘allure garconniere jumps into the fray with a brilliant and thoughtful response that recounts her own discovery of thrift and vintage as a working-class teenager. 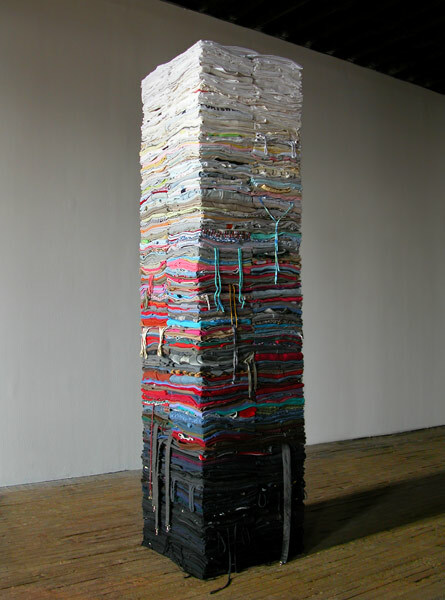 I create large geometric configurations from carefully folded and stacked second-hand clothing. These structures take the form of wedges, columns, walls and enclosures, typically weighing between five hundred pounds and two tons. Smaller pieces directly interact with the surrounding architecture. Larger works create discrete environments. 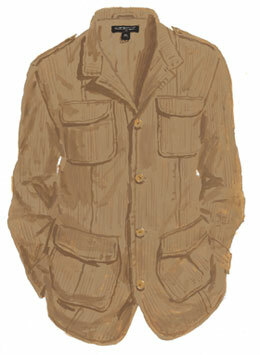 As clothing wears, fades, stains and stretches it becomes an intimate record of our physical presence. It traces the edge of the body, defining the boundary between the individual and the outside world. I’m leaving town in a couple days, so the series of posts on politics of vintage continues here with an excerpt from an interview with Sacramento’s Thunderhorse Vintage co-owners and twin sisters Marilyn and Jen Ayres, published in the UC Davis Women’s Resources and Research Center newsletter in May 2009 (read the full interview here). Jen began her graduate work in Textiles at Cornell University this fall with an eye toward theorizing thrifting via feminist cultural studies. Awesome! Kohgadai (UC Davis Women’s Resources and Research Center): What were your majors and minors? Jen: We transferred as design majors, before we really knew that we were feminists or into critical cultural studies, and attempted to take design classes and it was a shock. There was complete aesthetics divorced from theory, from accountability, any kind of critical analysis. That’s when we got out the registrar of classes and decided to do Women/Feminist Cultural studies 103, not realizing that at UC Davis you really have to take Women’s Studies 50 before getting into 103. So, it was very challenging. It was very challenging, very stressful but very mentally stimulating. It was this crazy, rigorous world that we hadn’t been exposed to. Kohgadai: How has your experience with your education influenced your shop and what you stand for? Mar: The disconnection between ideology and the production of images of art and design were completely antithetical to what we were about. So we went completely a different route. We decided to make ethical decisions, to know where things come from, and understand the meaning and, importantly: acknowledge where things came from — something so basic and simple. Being disingenuous, appropriating, and making a buck off of other people’s artwork, that’s what we didn’t want to do. That’s just the easy way out, that’s not critical thinking, that’s not special. Jen: The Women and Gender Studies Program really helped us become who we are, and helped us open and run the shop because it has those ties to intersectional feminist ethical principles that let us remain true to who we are and do business— without compromising, without exploiting. And it’s crazy because shopping today is all about what maquilladora your handbag came from in accordance with what’s in fashion at this very instant. And I think what we’re doing is complete in the opposite direction of that. Kohgadai: I noticed someone brought over clothes, do you do trade-ins? Jen: We emphasize to our friends: Please, we really want to circulate goods, to trade and swap things between us. If you want something that’s in here, please bring us some of your cute clothes because we like seeing goods go, and go to our friends. The thing about a good transaction is that it’s fair on both sides. Mar: Because there’s a lot of places you could go, and you won’t be paid a fair amount. Kohgadai: How did you first get interested in vintage clothing? Mar: We just love thrift shopping. When we were little, the first thing we would do when our parents would take us to a new town, was look up the thrift stores and just go there. We love seeing unique art, unique design from previous periods of time. 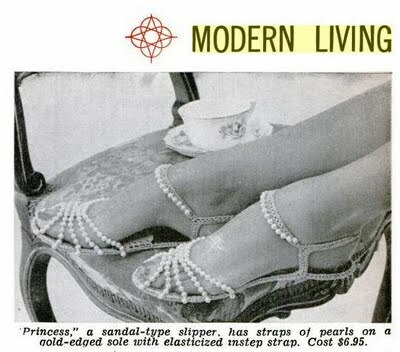 Cultural oddities that were no longer valued because they were no longer “in vogue,” or whatever. Having the discarded stuff, like Teenage Mutant Ninja Turtles Suspenders, the stuff that no body else thought was awesome, and kind of reclaiming that. 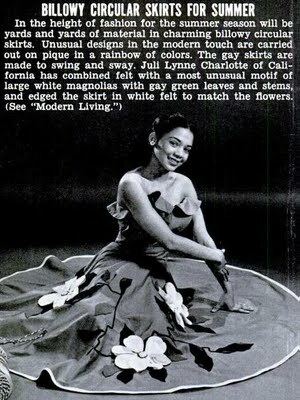 Now, its just coincidence that vintage is very much at the height of being in fashionable. Kohgadai: Did you always want to become clothing shop owners? Jen: To us this wasn’t a business decision. Getting to share our clothes with people that we love and cherish and having them wear it is the most enjoyable art. Mar: The whole idea of idea of collecting and accumulating crap, this whole American notion of getting as much material goods and just hoarding it, what happens with that is it just sits there unappreciated and unloved. It’s just something you go to once a couple months when you go through your attic. Jen: We want to have amazing stuff that the right person will come in and pick up. We want to be accessible. We don’t want a museum that you can’t touch, and engage with and love. (Like high priced vintage stores). We want to be able to display it, and have that right person come in and have something click for them. To us, clothing is a huge part of how you express your personality and its kind of an unrecognized art form. Kohgadai: Where did you two accumulate your clothing? Mar: We’ve been collecting since we were 14 (laugh). Jen was always very good at getting things from thrift stores, but what did she do with them? There wasn’t anything you could with it. Jen: It started out as a tie to my friends. I’m like “Oh, so and so will love it, and I’ll just hold on to it for her. Because I know she won’t be here at this thrift store, on this day to pick it up. And it’d be perfect for her.” I’m a giver. That’s how I express my love, I burden people with lots of crap (laugh). That’s how it started out. Having an eye with other people in mind. Kohgadai: Do you two share a wardrobe? Jen: NO. We’re identical twins so we have insane identity issues. For the longest time we had big hurdles to overcome about clothing because the way we perform our identity is through clothing. The way we perform a lot of things is through clothing: Gender, identity, sexuality, class, all these things. For our personal identity, when we are already genetic clones of each other, hell no we’re not going to be okay with sharing, because those are our individual signifiers. Then people might confuse one of us for the other, which would be crazy because we are *SO different (*sarcasm). I have been the one most afflicted with these insecurities, however. Mar has always been confident in her identity-in-relation-to-me. Kohgadai: Did you always want to be clothing shop owners? Mar: It sounds cliché to say we were inspired by Buffalo Exchange, but, we were really inspired by Buffalo Exchange on Height Street. When we went there as teenagers, it was like this crazy, eccentric collection of one-of-a-kind stuff. Vintage stuff, new stuff, but it was all crazy and unique. There was weird old stuff old punk and metal shirts from the 80’s and it was all very affordable. And we thought this is exactly what we want to do: to have a shop of weird stuff you can’t get anywhere else. 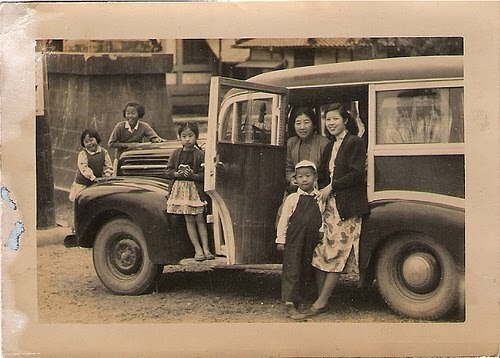 I recently discovered a couple shops here in Taipei that sell vintage found photos. This topic really deserves a longer blog entry (and hopefully I’ll have time to write one soon), but I find it very moving to see people who look like me doing normal things in time periods that I enjoy from a historical and aesthetic standpoint. It’s a rare thing. For example, I only recall Asian Americans being featured three times on as many seasons of “Mad Men”: the “Oriental family” in Pete’s office when he returned from his honeymoon, the waitress in a tight qipao and the (off-screen) Chinese driver that made Sally giggle. The series is one of my favorite TV shows, but it also reminds me that Asian Americans were marginalized (or worse) during the era it depicts. And, of course, depictions of Asians and Asian Americans in actual vintage US films are also problematic, to say the least. I often find myself feeling very conflicted about my interest in vintage style. How can I enjoy things from an era when Asian Americans were repressed, socially and legally (as with the Japanese internment camps and the Chinese Exclusion Act), and when many Asian countries suffered sociopolitical violence that traumatized millions of people, including members of my family? But secondhand and vintage items have had an emotional resonance for me since I was very young and, though it’s hard to explain, I can’t imagine my life without them. This is more than a hobby for me — it’s part of my identity. I am a modern feminist gal who likes fashions from the fifties, a time period which […] is not exactly known for being woman-friendly. How do I reconcile these contradictions? So, to try to answer these questions, I thought about my relationship with vintage patterns. 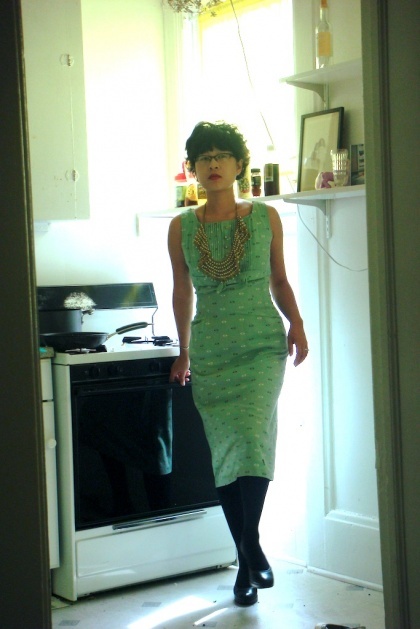 First of all, I like to sew 50’s fashions so that I can make them wearable for me, in 2009. I shorten hemlines so they’re more practical and modern. I make the waists wider so that they don’t have to be worn with a girdle. I lower the bust darts so an unpadded bra can be worn. I mix current ready-to-wear blouses and shoes with vintage-style skirts. In other words, I don’t dress as though I’m wearing a happy housewife costume. I think to most people, I look like a woman who is inspired by vintage fashion, but does not feel the need to look like Dita Von Teese or Betty Draper every day. But why do I like these looks? I hope it’s not some sort of self-loathing that makes me want to wear a symbol of women’s oppression. 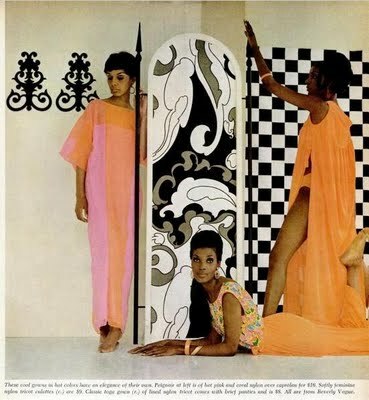 I simply prefer the silhouette of vintage fashions as opposed to the current styles offered by pattern companies. I think the design is better and the lines are more flattering. If you want to oppress me, try to make me wear a pair of skinny jeans! 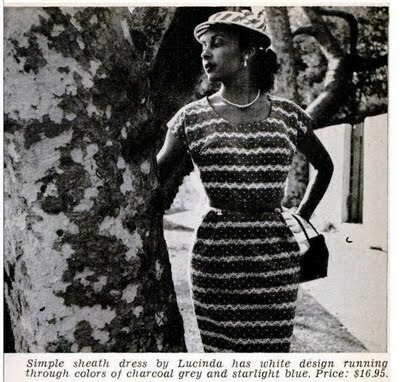 I should also note that I like vintage patterns because I’m interested in the historical and archival aspect of it. I think that sewing my way through Vogue’s New Book for Better Sewing is connecting me to women of the past. Doing this project, and researching the evolution of home sewing (women’s work, no doubt), is a way for me to honor the lives of women past (however painful) rather than pretending they didn’t exist. But within mainstream fashion systems, “vintage” styles are re-worked and brought back in a way that highlights their retro-styling and general ‘old-schoolness’; according to this logic, there’s no point wearing second-hand clothing if it could pass for something you bought new. (There are “designer recycle boutiques” that do specialise in second-hand clothing that looks new, but they tend to privilege ‘designer labels’ and ‘pristine condition’ rather than an overtly anachronistic look.) And ‘vintage’ transmutes the rituals and skills of personalisation that surround clothing in the second-hand fashion system into a hazier idea of “personal creativity.” This happens both in the retail environment and in fashion journalism. We all know that “vintage” is a much-abused term because it enables shops to ask large amounts of money for garments that are simply pre-worn – or even merely retro-styled. Owners of “vintage stores” openly buy up bulk clothing from flea markets, op-shops, garage sales and estate sales, carefully curating them and then marking the prices up vastly. These are the people who rock up at your Camberwell Market stall at 7am and go through your car boot with a torch before you’ve even unpacked. You’ll also see them at Savers with shopping trolleys piled high. This is starting to happen in high-street retailers too as they realise the market for ‘vintage’. For instance, Sportsgirl is currently selling second-hand cowboy boots for something like $150, but rather than the motley collection of items you fossick through at a second-hand store, they’ve been carefully picked to look similar. What’s more, they’re displayed alongside a rack of dresses that are marked “vintage” but, similarly, have a look of extreme curatorship in order to make them ‘match’ both each other and the new goods elsewhere in the store.